Watch the video preview of Yachting Monthly’s first ever electronic supplement. The app covers the wrecking antics of technical editor Chris Beeson and his crew of ship-breakers who demonstrate that worse things really do happen at sea. 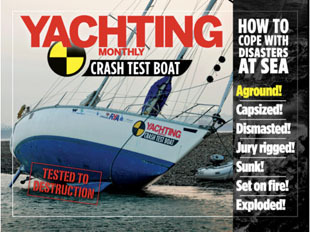 The Yachting Monthly Crash Test Boat App will be available to view on the IPC Media / Crash Test Boat stand and takes the viewer through all the disasters which can overtake sailors afloat: dismasting, jury rig, grounding, fire, capsize, hole-in-the-hull, seacock failure and gas explosion. The lessons learned from these serial disasters have been well received globally by thankful yachtsmen who are now much better armed against potential peril. The yacht which was subjected to this boating blitz was Fizzical a Jeanneau Sun Fizz 40 ketch, and her remains – following the final gas explosion off the Isle of Wight – will be on display at the London Boat Show in ExCel from this Friday.